3 Great Picture Books from Candlewick Press for Christmas! 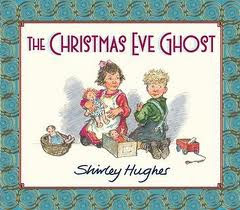 The Christmas Eve Ghost by Shirley Hughes is a charming picture book about a young boy and girl growing up in Liverpool during the 30's. They don't have a lot of money and their mom needs to spend every day gathering up the washing in the neighborhood. She has to leave her children alone much to her distress. A good portion of the book describes her backbreaking exhausting work. But it also describes some of the their other moments, such as going to church. They have neighbors that their mother is distrustful of, it would seem to be due their differences in religious belief, but it's not entirely clear. But one day, Christmas Eve, that will change! And you have to read the book to find out. The illustrations are lovely as well, evoking the feeling of the time period. The Christmas Giant by Steve Light is a lot of fun! 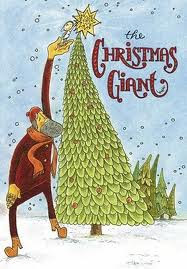 It follows a giant and his tiny friend who are normally in charge of Christmas paper but are given the opportunity to be in charge of the Christmas tree. But disaster strikes and they have to creatively salvage their special Christmas. This is a fun and engaging book and perfect for children learning to read, the pictures aid strongly in the comprehension of the text and there is a lot of repetition so that it can be easily understood. The pictures also have whimsical fun Christmas feel. This one I really recommend! The First Christmas illustrated by Sophy Williams tells the story of the first Christmas--as in the birth of Jesus as you might imagine. But it's an absolutely gorgeous book. It's a changing picture book, so you tug on the tabs on the pages and the pictures change. The illustrations are beautiful so this might be just the perfect book to read with the little ones in your life or maybe you'll just enjoy it as much I did! I'm not going to rate these books, but I do thank Candlewick Press for sending them for review!